An important anthology of Irish and Celtic solos for the 5-string banjo featuring a comprehensive, scholarly treatise on the history, techniques, and etiquette of playing the banjo in the Celtic tradition. Includes segments on tuning, pick preferences, and tablature reading followed by 101 jigs, slides, polkas, slip jigs, reels, hornpipes, strathspeys, O'Carolan tunes, plus a special section of North American Celtic tunes. A generous collection of photos of Irish folk musicians, street scenes, and archaeological sites further enhances this fabulous book. All of the solos included here are written in 5-string banjo tablature only with a few tunes set in unusual banjo tunings. The appendices provide a sizable glossary and a wealth of information regarding soloists and groups playing Celtic music, Irish festivals, music publications, on-line computer resources, cultural organizations, and more. If you are serious about playing Celtic music on the 5-string banjo, or if you don't play the banjo but simply want to expand your knowledge of the Celtic music tradition-you owe yourself this book. 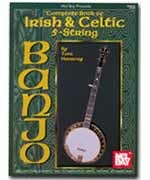 The first-ever CD collection of Irish and Celtic music for 5-string banjo provides 68 lovely melodies and demonstrates revolutionary techniques for playing highly ornamented tunes and rolling back-up. Recorded in stereo with virtuosos Gabriel Donohue (steel- and nylon-string guitar and piano) and Robbie Walsh (bodhran- frame drum played with a stick), the five-string banjo is 'out front' and plays through each melody in real-life tempo with authentic Celtic chordal and rhythmic backing. The recording features the music of all Six Celtic Nations and includes jigs, reels, hornpipes, slides, polkas, marches, country dances, larides, andros, slipjigs, strathspeys, airs and O'Carolan tunes. 35 songs in the book are not on the CD.